Twenty-five years ago (8/8/92), I stood on the Brooklyn Promenade and said “I do” to Wayne. Intrigued by the SITS Girls prompt, “If you were to describe yourself as a tree, what kind of tree would you be?,” some arborial thoughts on our 25-year old marriage. We aren’t a “flashy” tree like the Hawaiian Rainbow Shower (Cassia) tree, known for its eye-catching blooms, its frequent changes in appearance, or its notoriety. Same after 25 years of marriage. Growth gets a little less straightforward as the years go by. 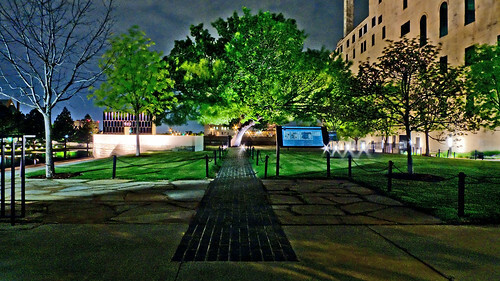 I read that elm trees represent “dignity and faithfulness.” This elm tree in Oklahoma City, the “Survivor Tree,” survived the 1995 Oklahoma City bombing and became an important part of the memorial. My daughter visited the Oklahoma City memorial earlier this summer and, comparing it to the 9/11 Memorial, said “it was so different in comparison, a place of looking forward.” We both place a high premium on being faithful to each other; it matters and I believe it will continue to make difference “looking forward.”. Even though I don’t consider us, as a couple, all that public or outgoing, we have made it a priority to deepen family ties. Ready for a tree pun? This involves, um, “branching out.” I love this beautiful live oak tree here in Tallahassee at Lichgate. From trying to make every get-together, and Wayne’s incredible cooking for those get-togethers, to the last three years taking care of Dad, reaching out has been an important part of our marriage. Deep roots are essential to a good marriage. I couldn’t find a great example of one type of tree that has the deepest roots in the world. Rather, I found this blog post explaining that strong root systems need water, oxygen, and space. In other words, it’s not necessarily the kind of tree you plant but how you treat it that makes a difference. Nietzsche was right, as was the blogger who emphasized the fact that you have to always be vigilant to create the right conditions. Smithsonian Magazine says this about the Baobab tree: “Its bark is fire resistant. Its fruit is edible. It scoffs at the driest droughts. It shrugs, and another decade has passed.” Sounds about right for 25 years of marriage! It may not be the prettiest tree on the planet but it is still there, while others have come and gone. Now we are caught up in celebrating the new marriages of relatives who were babies (or not born yet) in August of 1992, like my niece Olivia, who will be getting married in September (this is us at a recent party for her and her fiance, John Landon). My wish for all these new marriages is longevity, faithfulness, fruitfulness, open arms, deep roots, and strength. And for our marriage, 25 years in, a happy anniversary to us! This entry was posted in Reflections and tagged Ann Landers, Anniversary, Great Basin Bristlecone Pines, Lichgate, Marriage, National Wildlife Federation, Nietzsche, Oklahoma City Survivor Tree, SITS Girls, Smithsonian Magazine, Wedding Anniversary Tree by Paula Kiger. Bookmark the permalink. Congratulations! May the next 25 years continue growth in love, understanding and happiness. This is beautiful Paula! Congrats to you both! The tree analogies are beautiful and very spot on. Happy Anniversary! Thanks. They were lots of fun to do! Happy anniversary! I love the tree analogy here. What a lovely post–your photos, your words and their meaning. May you have many more years. Thank you – and I appreciate the tweet too! Happy Anniversary! What a great analogy. I’m impressed by your arboreal knowledge–not to mention the lovely way you wove it into a tribute to your marriage. Congratulations on this milestone, and a beautiful post. I am also celebrating an anniversary on 8/8 but ours is only 22 years. All of these things you said about marriage are definitely right on! Pinning it for sure. Great analogy, congratulations on 25 years! Love your pun of ‘branching out’ and how it’s an important thing in marriage that you do together. Thanks, Elaine. Truly, the tree analogies could have been evergreen LOL. Thanks, Jamie! Those are the best roots to have!